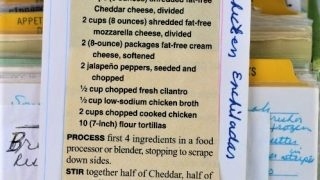 Front of the recipe card for Healthy Chicken Enchiladas. 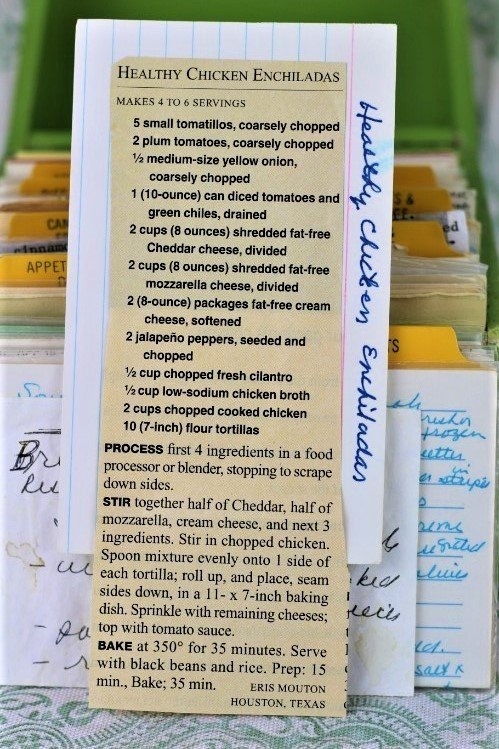 There are lots of fun recipes to read in the box this recipe for Healthy Chicken Enchiladas was with. Use the links below to view other recipes similar to this Healthy Chicken Enchiladas recipe. If you make this Healthy Chicken Enchiladas recipe, please share your photos and comments below! Process first 4 ingredients in a food processor or blender, stopped to scrape down sides. Stir together half of Cheddar, half of mozzarella, cream cheese, and next 3 ingredients. Spoon mixture evenly onto 1 side of each tortilla; roll up, and place, seam sides down, in a 11- x 7-inch baking dish. Sprinkle with remaining cheeses; top with tomato sauce. Prep: 15 min., Bake; 35 min.